Keelin Martinek ('13) graduated with a major in Archaeology. The Romans were known for their love of gemstones, especially emeralds and pearls. The precious materials used to manufacture this pair of earrings originated from different far-flung regions of the ancient world. While gold was mined in a number of Roman provinces (mainly Britain, Spain, Dalmatia and Dacia), emeralds, amethysts and pearls were imported from the East. While gold was the most highly valued metal, emeralds were one of the most valued stones in antiquity. They were prized not only for their rich green color and connections to fertility, but also for their perceived healing properties. According to Pliny the Elder, Roman jewelers would often sooth their strained eyes by looking at or through emeralds while they worked. Although the value of emeralds was great, it still paled in comparison with that of pearls. 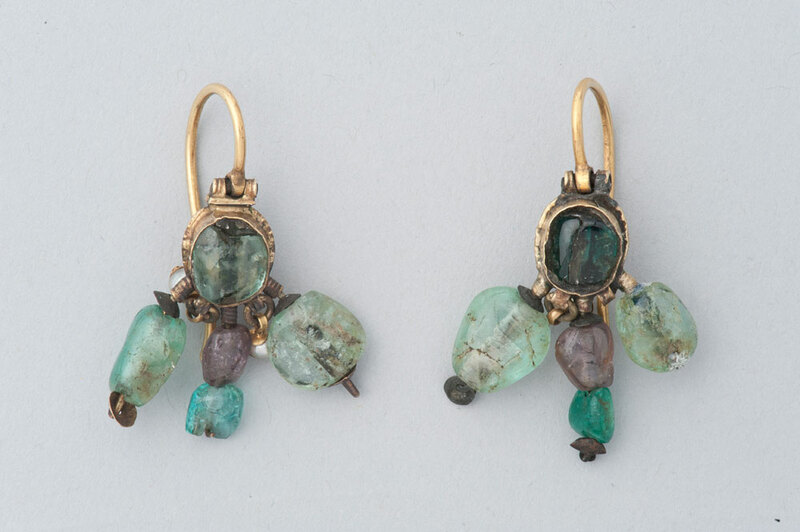 The tiny pearls that dangle between the earrings’ large emeralds would probably have drawn the most attention from Roman viewers. Pearls, or margaritae, were imported from India and the Persian Gulf, and were valued both for their uniqueness (no two are alike) and their brilliance, which was far greater than that of the uncut diamonds worn by the Romans. Owning a pearl – let alone earrings with two apiece – was considered a great luxury. The sound of the pearls rattling against the emeralds would also have drawn attention to the woman who wore these earrings, heightening the others’ awareness of her presence and status. The large emeralds may make up most of these earrings, but the pearls are what establish them as the true height of luxury. Before Alexander’s Eastern conquests in the late fourth century B.C.E., precious stones were not widely available in the Greek world. Greek jewelers prized themselves on their mastery of metalworking and used precious stones only sparingly. An important change in the design of ancient jewelry takes place, however, in the Roman period. Instead of elaborate patterns in gold, the new designs feature larger, brighter gemstones in simpler settings that contribute to a less finished appearance. Here we see the effects of this shift firsthand: while the earrings are certainly striking, their beauty derives from the combination of precious materials and the presence of large emeralds and pearls. Close examination of the structure of the earrings and the settings which house the stones highlights the unfinished appearance of the gold, clearly pointing to the jeweler’s preoccupation with emphasizing the gemstones. Grancsay, Stephen V. “The Art of the Jeweler: A Special Exhibition.” The Metropolitan Museum of Art Bulletin 35.11 (1940), 211-220. “Jewelry in the Metropolitan Museum of Art.” The Metropolitan Museum of Art Bulletin 10.6 (1915), 3-14. Mattusch, Carol C. Pompeii and the Roman Villa. New York: Binocular Press, 2008. Oliver, Jr., A. “Greek, Roman and Etruscan Jewelry.” The Metropolitan Museum of Art Bulletin 24.9 (1966), 269-284. Richter, Gisela M.A. “Classical Accessions: II. Jewelry.” The Metropolitan Museum of Art Bulletin 16.3 (1921), 55-60. Richter, Gisela M.A. “The Ganymede Jewelry.” The Metropolitan Museum of Art Bulletin 32.12 (1937), 290-295.